Superbly appointed, 3 houses from the beach. Enjoy this stunningly designed and superbly appointed pet friendly retreat. 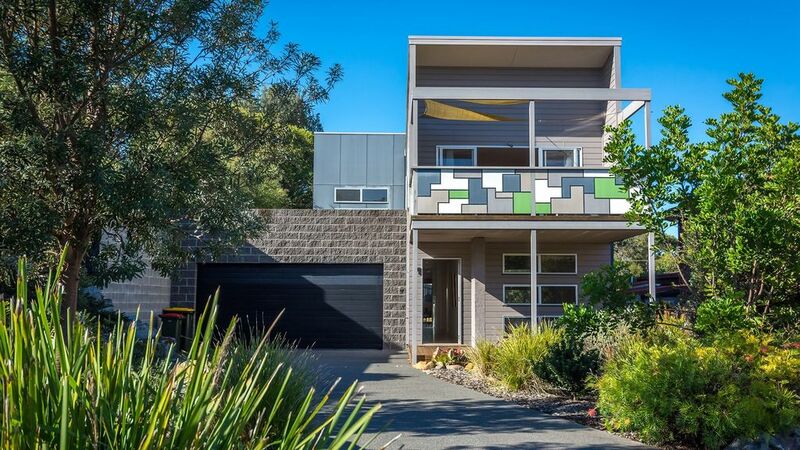 Enjoy this stunningly designed and superbly appointed 3 bedroom artists retreat located only 3 houses from the famous but usually deserted pet-friendly Culburra Beach. Everything about this designer home-away-from-home is about unwinding and indulging. Enjoy the huge DVD collection downstairs (where the kids can retreat to), whilst you delve into a novel on the couch upstairs. Everything about this pet friendly designer home-away-from-home is getting away and re-connecting with yourself, family and friends. Relax to your favourite tunes from the iPod docking station or sit back and savour a steaming coffee from the espresso machine. Enjoy a BBQ on the deck or cook up a storm with family/friends in the huge chefs style kitchen. Relax in the bath overlooking an enclosed private garden. Designed to be cool in summer and warm in winter, with beautiful timber and tiled floors throughout and carpeted bedrooms. Thirsty? The mojitos go down a treat either on the sunny upstairs deck or the shaded backyard area with beautifully manicured gardens and lawns whilst you sit back and enjoy the many birds that visit. Culburra beach enjoys regular visits from dolphins and seals and whales at certain times of the year. * Dog friendly - Culburra Beach is dog friendly. * 100+ DVD's to choose from. * 2 x large T.V.s both with DVD players. * Games, books and puzzles, cook books and candles. * Basic pantry items such as tea, coffee, sugar, sauces, spices, paper towels, etc. * BOSE Ipod docking station with great sound - bring your phone or ipod and just plug in. * Ice maker and water filtered double door SS fridge. * Bar fridge in rumpus/movie room downstairs. * Airconditioning both upstairs and downstairs. * Ceiling fans in 2 of the rooms. Culburra has two surf beaches, Warrain and Culburra Beach. It is also surrounded by a lake. Visit local markets and enjoy plenty of lovely coastal and beach walks. Also, visit the lighthouse at Crookhaven heads (about a 15 mins walk each way). Culburra also now has a Woolworths Supermarket where you can buy all your food stocks once you arrive. Lots of mountain bike trails and walks. There are plenty of popular fishing spots. Watch out for seals, dolphins and whales. Visit the lake and spot the gorgeous black swans during certain times of the year. Visit local areas such as Callala Bay and Callala Beach, Currawong and Huskisson. Enjoy a lovely dinner at the reknowned Butter Factory restaurant, (located a short drive from Culburra Beach). Culburra also has a local RSL Club, they have a pick up and drop off service, just make a call and they will come and collect you in their bus and drop you back home. Visit lovely Greenwell Point's Bowling Club for a bistro meal or visit their Chinese Restaurant. We are ex business owners with a passion for architecture and renovating/building homes in beautiful places. We believe The Art House offers a house with a difference. We have spent many years staying in different holiday rental houses up and down the coast and from this have gained a good knowledge of what is out there. We hope you get inspired when you enter The Art House. We endeavor to add/change art work and furniture pieces so that when guests decide to stay again they notice new things to interest them. The Art Cottage is another of our properties, located on the water front of the beautiful Jervis Bay in Vincentia. If you are interested in finding out more about The Art Cottage, give Mez a call on 0407 237 738. Large bathroom overlooking enclosed garden with bathtub and shower with choice of shower heads. Boss iPhone system for your own music. Happy family all round with plenty of space and nice yard for the pooch. Convenient food outlets and full Woolworths up the road . Very close to amazing beach with dog friendly 4pm off lead rules. Relaxing. Thanks so much Jeremy! Really pleased you enjoyed your stay. Makes us really happy to know. Hope you can stay again soon. We had a wonderful stay at the Art House. The house is very well appointed, the owner has obviously gone to a lot of trouble to think of everything you may need for a comfortable stay. We took our dog with us and the house was also very well equipped for this. With just a short walk to the beach we will definitely look to stay again. Thanks so much for your lovely review. It is so lovely to hear that you enjoyed your stay and yes, we always try our best to ensure guests have a great experience. We had a fabulous time at this awesome house! We visited the art house with another couple. The house works really well as we had our own bathrooms. There is everything you need at hand, the kitchen is set up really well. The glassware etc. is good quality which is a nice change from other beach houses we have stayed at. Mez is an awesome communicator and always at hand. We will definitely be back!! Thanks so much for your fabulous comments! We really care about our guests experience as we know only too well how hard it can be to get away. So we appreciate your feedback very much. Hope you can stay again soon. Great place for a dog, close to beach (100m), good amenities. Very clean and modern. Thanks Matthew for your great review, so glad you enjoyed your stay at The Art House. Hope you can stay again soon! We loved our return to the Art House - always lifts our spirits just driving up the driveway. So comfortable and spacious so everyone can do their own thing or get together for meals, movies or cards. Thanks for always living up to our expectations! Art house had all the features required to make the stay most enjoyable and the main benefit was that it was dog friendly with quick access to the beach. Quiet location and did not have the hustle bustle of Jervis Bay which we appreciated. So glad you enjoyed your stay Peter. We really do want guests to enjoy their break as we know how hard it can be getting away from everyday life. We love the fact that Culburra Beach is such a dog friendly place for the four legged family members and always know that they will love the visit just as much. We hope you can stay again soon.